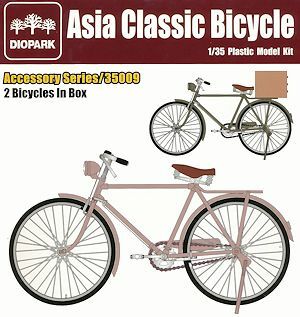 This new kit from Diopark is labelled Asia Classic Bicycle but could be used virtually any setting but of course would look right at home in a Vietnam era diorama. 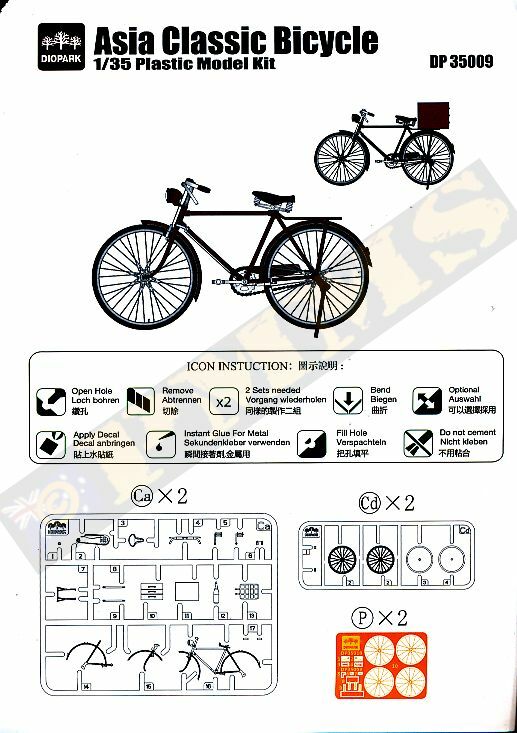 You get two complete bicycles in the kit which consists of 50 parts in light grey plastic and 26 etched parts for the wheel spokes and other smaller details. 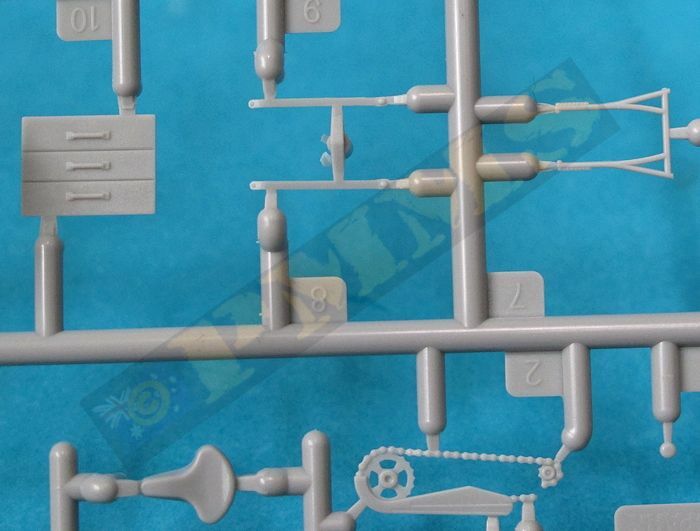 That's 25 plastic and 13 etched parts per bicycle. Note the etched fret is shared with the Diopark WWII British Military Bicycle Kit#DP35010 and so there are few parts not used with this kit. 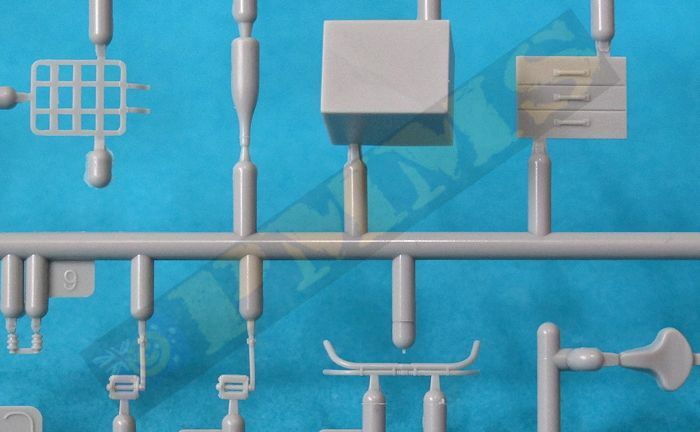 The standard of moulding is excellent with no flash or other blemishes on the parts and just the usual fine moulding seems and small moulding nodes to be removed before assembly. The etched parts are also well done with numerous very fine parts than need care removing from the frets. 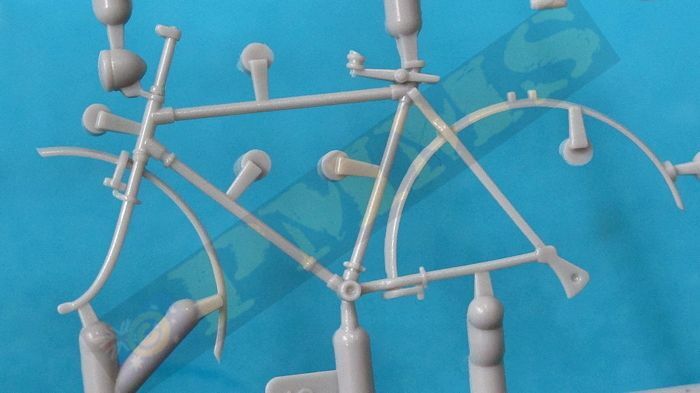 The bike frames are moulded commendably thin for a good scale appearance as is the chain that while in plastic has very good detail definition; the frame is moulded in one piece including the fixed front forks so if you wish the have the front wheel tuned you would need to cut off the front fork and reposition accordingly. 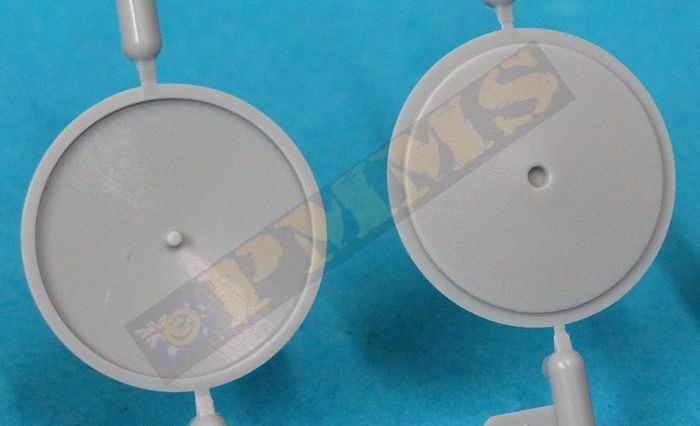 The notable feature of the kit is the wheels which are moulded with plastic spokes but you also get etched spokes to use for greater detail. To use the etched spokes you need to cut away the moulded plastic spokes from the rims and replace with the etched spokes. To aid with the etched spokes is a two part jib to get the correct dome bend for the spokes, you also need to take care when gluing the etched spokes to stagger the spokes on each side for the correct appearance. The tyre tread is nicely textured but removing the central mould line can also remove some of the texturing so care is needed, this does though give the impression of a slightly worn tyre. All that is needed is the addition of the brake cables to finish off the model. 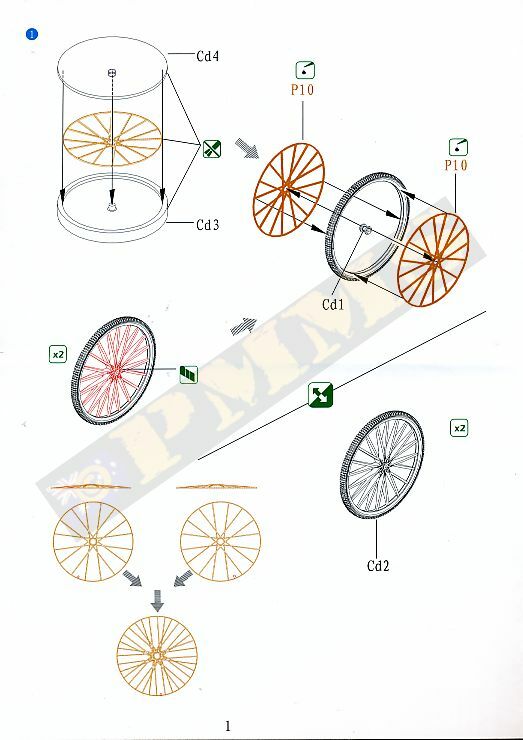 The small four page A5 sized instruction sheet has exploded view drawings and is quite easy to follow given there isn't a lot to assemble, the most time consuming will be adding the wheel spokes but the end result will be worth the effort. 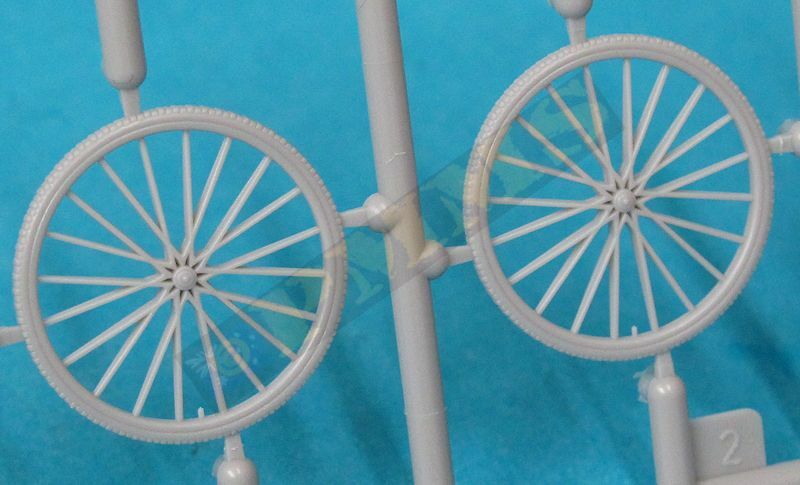 The main assembly in the kit is the wheels if you decide to use the etched spoke option and not the moulded plastic spoke wheels which are woefully over scale and inaccurate, to get the most out of the fine frame mouldings in the kit the spokes are really not a choice. See link to Etched Wheel Spoke Assembly below. With the wheels assembled the remainder of the kit is quite straightforward although care is needed due to the very fine mouldings for the frame, handlebars and smaller parts. 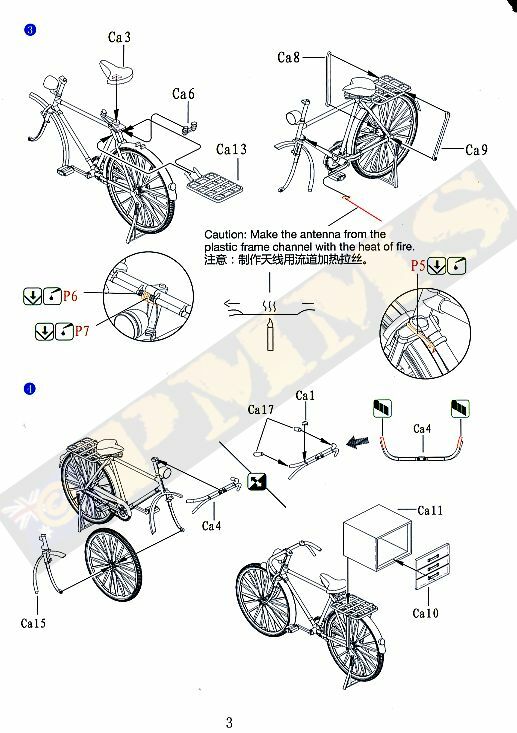 The right rear frame has the chain fed through the frame so the large pedal sprocket in on the outside and the smaller drive sprocket on the inside of the frame and then the wheel is fitted to the left frame and the right frame with chain attached trapping the rear wheel in place, just make sure the wheel is parallel to the frame as the glue dries. Added to the rear frame is the seat and rear luggage rack plus the pedals which can be set at any angle, the fit of the parts was very good just take care fitting the support arms for the luggage rack to get these even on both sides. 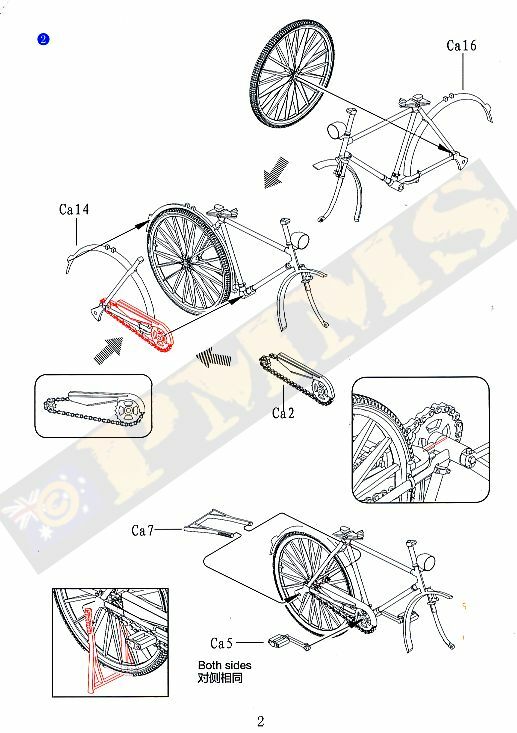 The left front fork is moulded with the main frame and the is attached to the fork with the right fork added trapping the wheel between the font forks, the wheel is fixed in the straight forward position and can’t be altered as the kit comes, if you wanted to alter the angle of the front wheel the forks would need to be cut from the frame and repositioned along with the handle bars. The handle bars have two types of grips, those that are just the handle bar without any grip or you can cut off the ends of the handle bars and replace with the slightly larger hand grip if you wish. There is also a separate bell and this very small and round making it quite slippery to handle when removed from the sprue do take care. There are three very small etched parts added to the handle bars to finish off the detail and care is needed fitting these as they are quite small. The rear bike stand can be added in the lowered or raised position as you wish and there are additional items to use as optional extras, these include two sizes of the commercial signs hung from the top frame bar and a large chest of drawers for the rear luggage rack, this arrangement is often seen in Asian settings and basically any load can be added to the rear rack as you see fit. All that is needed to finish the model is add the brake cables from thin sprue, wire or whatever is preferred but remember the brake lines are not that flexible so only have sweeping bends and using wire makes it difficult to achieve this so a thin plastic of solder may make a better medium for the brake cables. 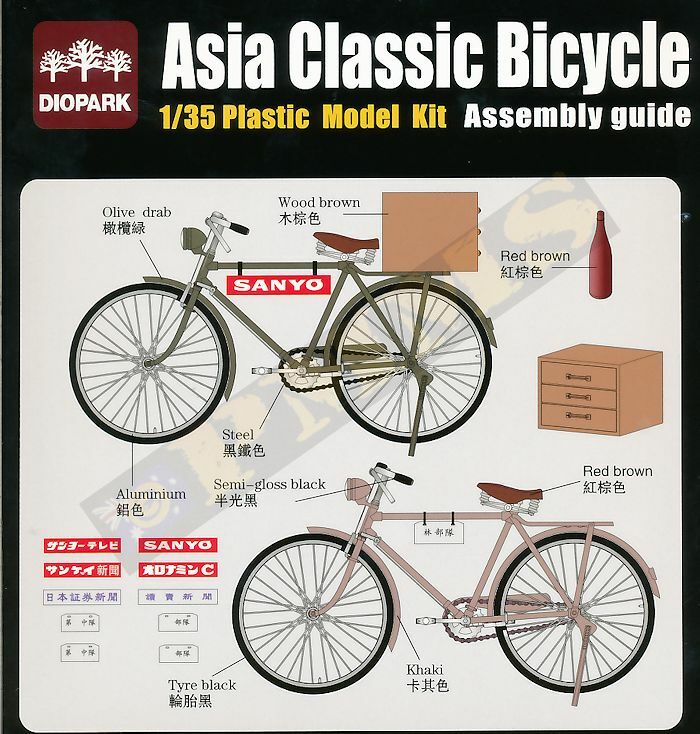 As mentioned above the bike can be used in any setting other than the Asian as the bike frame and features is similar if not the same the any used from the 1930 onwards with just minor alterations, the rear bike stand is a typical Asian feature so this can be left off the and bracket cut from the frame if you wish to use the bike in a European setting. Of interest in the Tamiya set "German Soldiers with Bicycles" Kt #35240 the bike frame, handlebars, pedals and rear luggage rack and almost identical in design to that in this kit although the mouldings are considerably heavier from what is in this kit as well as the wheel spokes being thick moulded plastic. 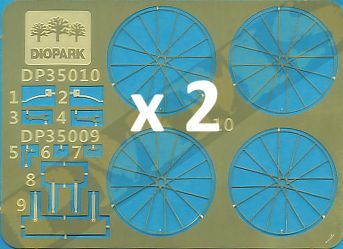 This set from Diopark can be adapted to use as a similar German Bicycle but removing the rear stand as mentioned and adding the tool box usually carried under the top frame as well as adding the hand pump making for a quick and easy adaption and also resulting in far more detailed bicycle than you get with the Tamiya kit. This is an excellent rendition of a typical civilian bicycle optimised for an Asian setting but could be used anywhere with the finesse of the frame mouldings and etched spoke wheels being a standout feature. The assembly once the wheels are done is quick and easy and you are ready use in any diorama setting preferable with the detail on bike being one of, if not the best I have seen for a bicycle kit with the fine frame mouldings and etched spokes giving a very good scale appearance. 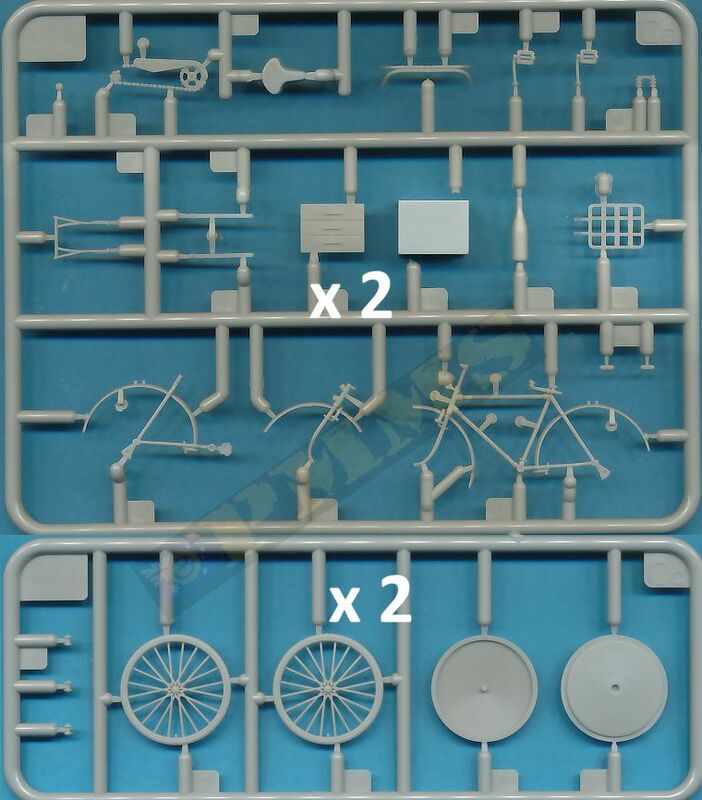 This small kit should be welcomed by modellers as it offers many possibilities and the inclusion of the two bicycles in the kit is a good bonus to double the value.